← Watch NFL/College Football Live Online-Any Game ! 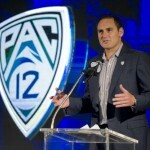 TweetThe Pac-12 announced that it will not be expanding, thus making the Super Conference Pac-16 only a dream. With Texas launching the Long Horn Television Network with ESPN, it seems to not match up with the plans Pac-12 Commissioner Larry Scott has with his Pac-12 Regional Network. Although it’s probably the best move for the conference right now, to not rush into a power conference, some are still hoping that it happens. USC hosted its first inaugural Pac-12 game versus Utah Sept. 10, and continues to look forward to playing teams they haven’t in a while. One thing is for sure, college football still has questions lingering about possible changes, will Texas A&M leave the Big 12 ? Although this is only the beginning for the Pac-12, could it be the end of the Big 12 ? Stay tuned . . . This entry was posted in Advertisements, college football and tagged big12, larry scott, ncaa, pac12, texas, texas a&m, usc, usc trojans, utah. Bookmark the permalink.